The solution is simple to start Auto-Hide-Mouse-Cursor Free always minimized eg. to-tray! 1.) ... Put Auto-Hide-Mouse-Cursor for Windows in tray area! 2.) ... Auto-Hide-Mouse-Cursor for Windows on top, why and for what? See also: ► Classic and New Strategy? Please start the Program Auto Hide Mouse Cursor and click on Options and please select Always start minimized (system tray) to start the program AutoHideMouseCursor always in the notification area (To-Tray)! (Image-1) Start Auto-Hide-Mouse-Cursor always to-tray! But some of the user will see also others programs on top! (Image-2) Disable Always ON-Top the Auto-Hide-Mouse-Cursor! In order to start the mouse cursor Hide software always Minimized in the info area of ​​the Windows taskbar To start it does not require any mouse cursor expertise. The elegant solution is not only written for Windows 10, although this screenshot has been made under Windows 10. You can use this program to hide the mouse automatically as a solution without any problem even on earlier versions of MS Windows operating systems. The mouse cursor tool does not care if it is a Windows desktop computer, or in the mobile tablet PC, Surface Pro / Go, or even on a MS server operating system where the mouse cursor can also be very annoying. 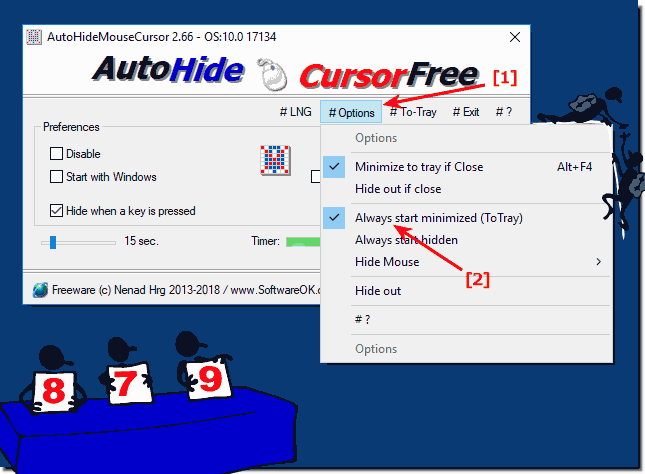 AutoHideMouseCursor - FAQ-2: Can Auto Hide Mouse Cursor Free always start minimized (to-tray)? Hello from US. thanks for the great freeware. it compliments wallpaper_engine and fences quite well. i have but one simple question. in what circumstances might i need to set autohidecursor to "always on top"? the only other program i've ever set to "always on top" is windows task manager so i can kill a frozen full-screen task. so why might i need to set autohidecusor to be "always on top"?